One-seater electric automobiles may be on the rise, thanks to vehicle-sharing apps and range improvements in batteries. It is possible that these one-seaters will be a slothful and anti-social mode of transportation, like they are in Wall-E. Perhaps more likely, however, is that one-seaters will facilitate transportation that is actually more healthy and social than our existing four-wheel-dominated system. One-seaters may promote cycling, either via velomobiles (one-seater lightweight pedal-cars with an electric motor so that cyclists don’t have to break a sweat going uphill) or via the creation of more bike lanes in cities with relatively extreme climates (lanes which one-seaters would have mostly to themselves whenever the weather is not friendly to bicycles). One-seaters may also promote transit ridership, by making it easier to get to or from stations. How then should cities prepare for one-seaters? While it would be nice if streets had three separate lanes for buses, bicycles, and one-seaters, this is not likely to be politically viable any time soon. Cities may need to be more creative, and more compromising, in seeking ways to promote one-seaters as an alternative for normal cars without unduly limiting transit or bicycle usage. One possible way of doing this would be a sort-of seasonal three card monty, using a bus lane and an adjacent bike lane. When the weather is bad – say, during winter or a long heat wave – one-seaters would share the bus lane with buses and use the bike lane as a parking lane. This would allow a senior citizen to park close to his or her destination (or his or her bus stop), to avoid slipping on ice. It would also allow one-seaters to overtake buses at bus stops: if the bus pulls up to the curb at stops, a one-seater could pass the bus on its left. Similarly, it would give one-seaters the option of pulling over to let a bus overtake them. When the winter or heat wave ends, the one-seater-parking lane would become a bike lane, usable by bicycles and one-seaters both. This would create less traffic for buses, at a time when the weather is nice enough to make walking to and waiting at bus stops a convenience. One-seaters and cyclists would however also be able to use the bus lane in order to overtake slower cyclists ahead of them, and to overtake buses at bus stops. Indeed, at times when buses do not run too frequently (nights, weekends), the bus lane would be left more or less open for one-seaters and the bike lane more or less open for bicycles. It is true that bicycles would, comparatively, be the losers in this relationship. They would have to give up their bike lanes during the winter (or, in very hot climates, during the summer), and share them with one-seaters during the rest of the year. Nevertheless, given how few streets currently have bike lanes, cyclists might still benefit hugely from this relationship, particularly in climates in which bicycling tends to be a seasonal pursuit. Let’s use a real-world example of where such a system could maybe be effective: Scarborough, Ontario. Scarborough is a suburb of Toronto, where the weather and distances people travel can be difficult for cyclists in the winter – and often in summer as well. Unlike Toronto’s other suburbs, the shape of Scarborough’s coastline is slanted, giving the city’s main cycling path, the Gatineau hydro corridor (image above, map below), a diagonal shortcut route through the fairly strict grid pattern of the city’s streets. In a few years this corridor will be linked with the city’s newest half-subway line, the Eglinton Crosstown. 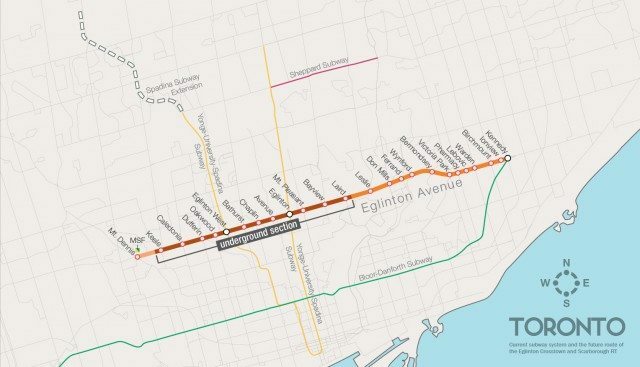 The hydro/cycling corridor already connects, more or less, to a another subway line (via a short offshoot), a hospital, a university, and, via the Don Valley, to downtown Toronto. Another, narrower diagonal hydro corridor, meanwhile, which nearly links up perpendicularly with the Gatineau around Lawrence East SRT station (which may eventually become a SmartTrack GO Train station, even if the SRT rail line is closed and is not replaced with an LRT along the same route), could become a shortcut route in another direction. If one-seater lanes were built in these diagonal hydro corridors, and if a three card monty bus/bike/one-seater system were implemented on a number of Scarborough’s main streets intersecting these corridors, then the suburb’s transit, cycling, and driving might be significantly improved. Ideally, it will one day become easy to ride a bicycle or a velomobile from U of T Scarborough campus all the way to U of T in the heart of downtown T.
Busses can be driven by bus drivers, by computers, or by passengers. Bus drivers are the most sensible option, but are expensive in places where busses are forced to crawl along in traffic jams instead of getting their own designated lanes. Computers are the cheapest option, but are creepy and may not be ready to operate safely in bustling or wintry cities for many years yet, if ever. The idea of having passenger-driven busses, however, has never even been discussed as far as I can tell. And probably with good reason, since the idea appears to be ridiculous. Ridiculous ideas are at least interesting though, so: let’s discuss how a passenger-driven bus might actually work. The first step would be to create a bus so easy to drive that anyone with a driver’s license could do so without having to face a steep learning curve. Busses are already not so difficult to drive, so this is not really beyond the realm of plausibility, unlikely though it may be. If buses were also to be equipped with a comparatively low level of automation — for instance, if the bus were able to automatically keep within its lane, pull up to the curb at bus stops, change or merge lanes when directed to do so, make turns at certain specified intersections, pull in to bus stations, etc. – then operating a bus could perhaps become as easy as driving a car. If you were to give these buses their own separated bus lanes they might become even easier to drive than a car. Express bus routes, which stop only at bus stations rather than making many stops along the way, would be easier to drive too, and might also help to entice passenger-drivers given that such routes would not take as much time to drive. Alternatively, or additionally, if the bus simulations that trainee bus drivers already use were to become cheaper, better, and ubiquitous, many more people could learn to drive conventional busses. The second step would be to create a service, a sort-of car-sharing app for buses, that would ensure that only designated drivers would be able to turn on the buses’ ignition and drive them. The driver would schedule a bus route from one bus station to another, and be paid based on how far or how many other passengers he or she drives. Upon arrival at the destination bus station, the driver-passenger would park the bus – or, perhaps, the bus would park itself – leaving it there for either another passenger-driver or a professional bus driver to use. By doing this, the supply of bus drivers could be greatly increased, thereby allowing for more frequent bus services. It might, in addition, allow for cheaper bus services, since passenger-drivers might be willing to accept lower wages, as they would be simultaneously benefiting from being passengers as well as drivers. Ideally, passenger-drivers would not end up replacing or undercutting professional drivers’ wages, although of course it is plausible that they would do so. One question, obviously, is how such a system could be profitable if the buses end up sitting unused for long stretches of time after one driver leaves and before the next driver arrives. The answer is that the system would not work in that case; it would only work if the supply of drivers was large and consistent enough that the buses would not remain idle for too long. Nevertheless, because paying drivers is such a large share of the cost of buses, they might be able to remain idle for some time at least before becoming unprofitable. Moreover, steps might be taken to limit buses’ idleness or increase the utility of their idleness. Dynamic market pricing might be effective: whenever a bus becomes idle, the wages offered to passenger-drivers could increase in order to induce drivers to come and drive it. If nobody steps up to take the wheel even then, a professional bus driver could be summoned instead. Idle buses, meanwhile, might be able to serve as portable, air-conditioned or heated bus stops on streets which allow street parking or have bus turnouts, which could be useful in hot, cold, or stormy weather. The concept of passenger-drivers might, however, be more likely to begin in carpools or vancabs or minibuses, rather than in full-sized buses. This is because there are so many more people who are able and willing drive a car than a bus, and because it is easier to park a car than a bus for times when the vehicle is idle. Lately BMW, for example, has begun to offer a combination car-sharing/ride-sharing service, intended for people who want to be ride-sharing drivers but do not own a car. It is possible that in some cases this service will be used by passenger-drivers, drivers who are going to destinations they were already heading towards themselves. Still, such a service would not have the same positive impact as buses. Carpools carry many fewer passengers and take up much more road space per passenger than buses. Buses – especially electric trolleybuses– can be much cheaper and cleaner than even the most efficient carpools. The purpose of a passenger-driven bus would be to offer, in effect, a compromise between the affordability and scalability of computer-driven busses and the viability and desirability of human-driven ones. It would make use of the advantages of car-sharing and ride-sharing technologies – the ability to smoothly match the supply of vehicles and drivers to demand – but avoid their primary disadvantage; namely that cars, even carpools, tend to be extremely inefficient and costly compared to busses. If the idea were to actually work, it would allow cheaper, more frequent bus service options to supplement (though hopefully not undercut) the more expensive existing bus services driven by professional bus drivers. And it might achieve this without the use of robots. Okay, it’s true, this idea sounds crazy. (Though not as crazy as some). It is basically the transit equivalent of self-checkout machines at grocery stores. …But then again, almost anyone can drive a bus, right? It takes a lot of time to unload a large truck and sort and store its contents. This means that trucks tend to make deliveries during the daytime, when the cost of paying people to unload trucks is relatively low. If, however, the process of unloading trucks and handling their contents becomes automated, overnight deliveries may become much more common. At night trucks are able to avoid being caught in, and contributing to, traffic jams. Making more deliveries in the evening or overnight may, in turn, lead to an increased demand for electric trucks. Electric trucks are far quieter than diesel trucks, which is obviously an important trait for nighttime delivery vehicles. They can also be operated relatively cheaply overnight, given the generally much lower price of nighttime power. If – an enormous if – electric trucks do not need batteries that are heavy, bulky, pollute, and frequently need to be recharged, they can also operate many times more efficiently in general than can diesel trucks. This is mainly because electric vehicles do not pollute city air, and because electric motors and the power plants that generate their electricty can be several times more energy-efficient (and potentially far more eco-friendly) than internal combustion engines. But it is also because electric vehicles can have regenerative breaking systems that recapture some of the power they expend, and because they have dynamic break systems and motors with very few moving parts, and because they have far stronger torque that helps them climb hills. Unfortunately, the batteries needed to power trucks are too heavy, bulky, polluting, and range-limited*. This is especially true of batteries for large trucks**, which are the most cost-efficient and eco-friendly types of truck — and which would remain generally the most efficient types of truck even if all trucks were to become self-driving. Barring a breakthrough in battery technology, this only leaves one other option: electric trolleytrucks. These get their power from overhead power wires, somewhat like streetcars do. They then use small batteries in order to travel short distances away from these overhead wires. Some cities already have large wire-powered networks. Vancouver, for example, which is a city especially suited for electric vehicles given its hilly terrain and cheap, clean, hydropower-generated power, has close to 300 kilometers of wired roads, which it uses for trolleybus transit. Luckily, trucks making overnight deliveries can avoid the challenges that have thus far prevented trolleytrucks from being commonly used. The main challenge for trolleytrucks has been city traffic. Because they can only travel a few kilometres away from their power wires, they cannot handle the risk of getting caught in stop-and-go traffic. Overnight, however, the lack of traffic and much longer green light-red light cycles removes this risk. It also means that should a mistake occur that does leave a trolleytruck stranded away from its power wires and out of battery power, it could simply wait for a support vehicle to come and charge its battery, without causing any road traffic blockage as would occur if it ran out of power during the day. This effectively much extended range away from the wires at night also helps solve another main challenge: lots of people find trolley wires unaesthetic. The ability of trucks to travel further away from the wires at night means you don’t need as many streets wired. You might even be able to get away with only having some highway corridors — where aesthetics is not a problem – wired. The trucks could run on the wired highways during the daytime, then run mostly off-wire overnight to get a few km in the city to make deliveries further from the wired corridor. A final, hugely significant challenge, which trolleytrucks must face regardless of whether they run during the day or night, is the cost of intermodal cargo transfers. Even if a trolley wire-building spree were to occur, most roads will remain unwired for the foreseeable future. As such, for trolleytrucks to be competitive with diesel trucks, the cost of transferring cargo between trolleytrucks and other vehicles – notably, diesel trucks and trains – must fall. Trolleytrucks being more efficient than diesel trucks will not be sufficient to make them ubiquitous. This can be seen already by looking at the fact that trucks transport much more freight than do railways, despite railways being more efficient than trucks. If autonomous loading and unloading of trucks, and autonomous sorting and storing of trucks’ cargo, dramatically reduces the cost of intermodal cargo transfers, as seems likely to occur (or at least, plausible), then we might expect the use of cargo railways and of trolleytrucks to increase relative to the use of less efficient diesel trucks. railways’ share of freight transported relative to trucks, one result may be that a larger share of trucking will take place in hilly or urban areas where railways are less competitive. And, since hilly and urban areas are precisely the areas where electric vehicles are most useful — in hilly areas because of their torque, dynamic breaking, and ability to go through tunnels without spewing exhaust that requires ventilation; in urban areas because of their low air and noise pollution – this might further increase the use of trolleytrucks (and trolleybusses!) relative to diesel. Fighting for bike lanes, pedestrian spaces, HOV/bus lanes, and right-of-way streetcar lanes is difficult in Toronto. Much of Toronto’s population is suburban, and much of Toronto’s tax revenues are controlled by an Ontario government that is partially influenced by Ontario’s largest industry, car manufacturing. Still, most of this fight has focused only on how to share road space. In my opinion, what we should be pursuing instead is a plan to share road-use time, in order to reflect the fact that the needs of Toronto — especially as it relates to bike lanes — are very different in summer than in winter. The political compromise we should be pursuing should be to make Toronto a great city for transit, cycling, and pedestrians during the warmer, brighter half of the year, while allowing cars to continue to be the dominant form of transportation during the colder, darker half of the year. In the winter, most people do not want to bike, fewer people want to walk to transit stops or wait at outdoor transit stops, and more people want to have street parking so they do not have to walk far to get to and from their parked cars. This will only become true as Baby Boomers get older, as the risk of their slipping and falling on ice becomes more significant. In summer, on the other hand, more people want to bike, people do not mind walking further to and from their parking spot as much, and people do not mind walking to or waiting at a transit stop as much either. In summer there are also more tourists in the city, who want to use transit (or taxis), and walk or bike. Summer tourism is likely to increase in the future as technology makes it easier for people to travel more, given that many other cities in North America (and the world) are unbearably hot in summer, and given Toronto’s proximity to the lakeside cottages and camping sites of the Canadian Shield. There are also smog issues during the summer, which could be reduced by using cars less often. Of course, most people won’t rent out their car like this for half the year. But as long as some do, it should be sufficient, given how much more utility can be gotten out of a single car when used as an Uber/UberPool/Car2Go type of vehicle, as compared to when used as a conventional car that mainly sits idle all day and night. So, instead of fighting for transit-only/cycling/pedestrian/carpool lanes, we should advocate for transit/cycling/pedestrian/carpool seasons.